This B&H Kit includes two ezviz Mini O 1080p Wi-Fi Cameras. These Wi-Fi cameras capture 1080p video and are equipped with a 2.8mm fixed lens that delivers a 115° horizontal field of view. They offer up to 25' of night vision, two-way audio communication, and motion detection. 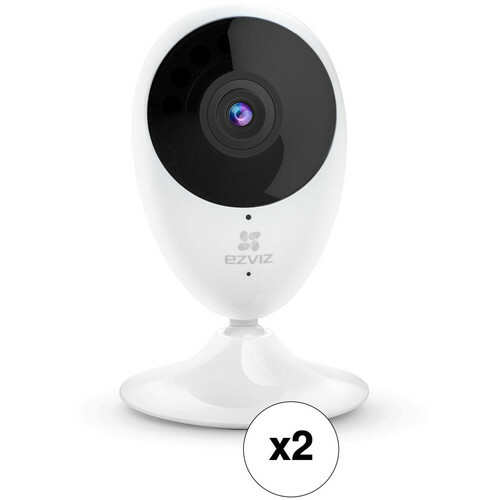 Monitor an indoor space with the Mini O 1080p Wi-Fi Camera with Night Vision from ezviz. This Wi-Fi camera has a 1/2.7" progressive scan CMOS sensor to capture 1920 x 1080 resolution video at up to 15 fps. IR LEDs deliver a night vision range up to 25'. The camera's 2.8mm fixed lens has a wide 115° horizontal field of view. Additionally, this camera is equipped with two-way audio communication thanks to a built-in microphone and speaker. H.264 video compression keeps file sizes manageable while maintaining quality. Remote viewing is possible thanks to the EZVIZ app for iOS and Android mobile devices. A built-in card slot supports microSD cards up to 128GB. microSD cards are available separately. Box Dimensions (LxWxH) 6.0 x 3.7 x 3.6"